Some games can get too good that it becomes a necessity to release a sequel for it and the same can be said with Irish Eyes. 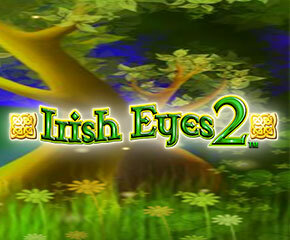 Irish Eyes 2 is the sequel for the popular game by Nextgen called Irish Eyes and is every bit as captivating as the first installment. The game has pleasing visuals and the soothing audio track which relaxes players instantaneously. But the game is not all in for just relaxing and can get pretty rewarding if your rewarding if your lucky. The Irish are known to be harbingers of luck and fortune and the same can be said for this exciting sequel. Filled with symbols that all pertain in one way or another to Ireland and its surrounding regions, the major symbols to watch out for are the Irish ladies and the pot of gold. The Irish Eyes 2 is a 5 reel and 25 paylines slot game. The best part about this game however is the fact that the paylines and bet amounts can be adjusted. You can choose to get between 2p and £ 5 per like which means the whole game can be played between 50p and £ 125 when you’re playing using all the paylines. 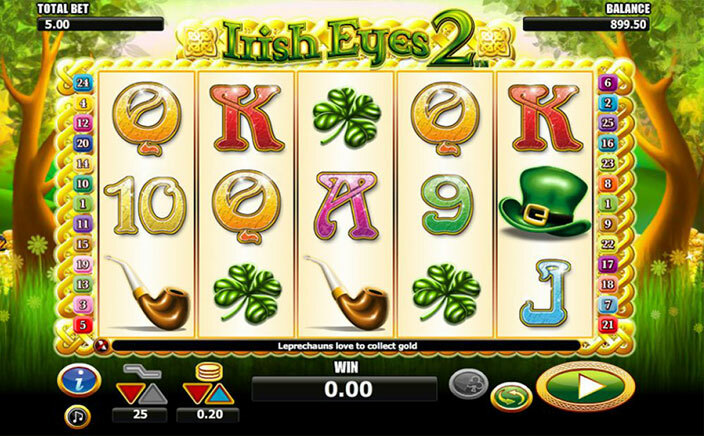 Irish Eyes 2 has a typical set of features which are all designed to bring you luck. The game mainly consists of wilds and sscatters but getting matching symbols alone can help you win considerable amounts. The Irish lady is the wild symbol and getting her on your reels can bring you great luck. These wilds are symbol substituting wilds and work on all symbols except for the scatters. The pot of gold is the scatter symbol and getting 3 or more of these unleashes the free spins bonus game. Getting e scatters gives you 10 free spins while getting 4 or 5 scatters gives you 15 and 20 free spins respectively. All the returns during this round are tripled. The matching symbols themselves offer considerable amounts. The shamrocks offer 400 coins while the leprechaun offers 750 coins. However the highest paying symbol besides the wild is the heart shaped golden ring which pays 1500 coins. The Irish lady however gives a whooping return of 5000 coins. Irish Eyes 2 is a great game and a great sequel from its maker. The game has absolutely everything that made Irish eyes a hit preserved while it has also some minor changes in effect to give it a sense of a different game. The adjustable stakes and betlines are a welcome addition and makes the game playable by all kinds of slot gamers with all kinds of budgets.